Karim Benzema spared Real Madrid's blushes with a match-winning brace in a 2-1 victory over Eibar at Santiago Bernabeu. Zinedine Zidane's men were out produce a response after defeat at Valencia, and although their collective performance was underwhelming, Benzema proved decisive to give Los Blancos' coach a win in his 100th LaLiga game at the helm. The hosts' pressure told after the break, however, with Benzema, who previously had two goals disallowed, netting with a towering header to restore parity before repeating that feat late on to secure all three points. 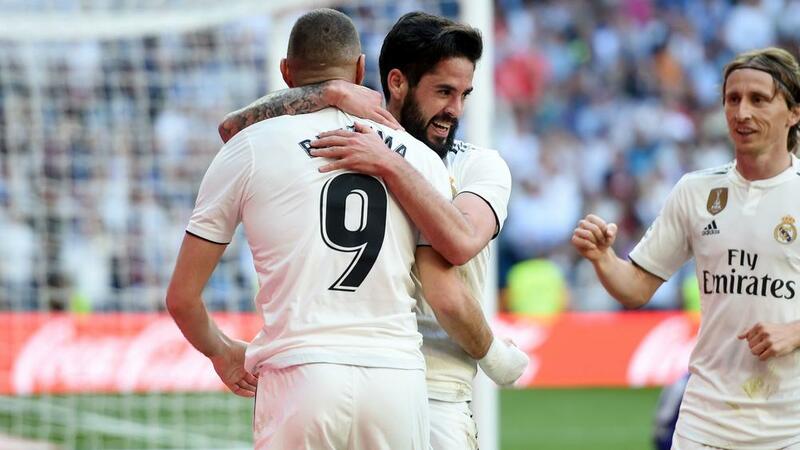 Madrid looked livelier during the early exchanges and did find the net in the ninth minute, but Benzema's celebrations were abruptly halted as Gareth Bale, who provided the pass, had strayed offside. Yet the hosts fell behind shortly before half-time, as Gonzalo Escalante carved open the Madrid defence with a brilliant pass to pick out Cardona, who flicked over the helpless Keylor Navas. Madrid was again denied by the offside flag early in the second half, VAR (video assistant referee) confirming Benzema made his run too early before making the most of a defensive mix-up to put into an empty net. It was third time lucky for the Frenchman, though, as he met Marco Asensio's cross with a header which bounced up off the ground and into the roof of the net. Benzema completed the turnaround nine minutes from time, this time rising to meet Toni Kroos's right-wing delivery and picking out the bottom-left corner. He should have completed his hat-trick towards the end but missed two sitters, while a post denied him from scoring again in added time, although it did not impact the result.